Barn with silos and outbuildings. 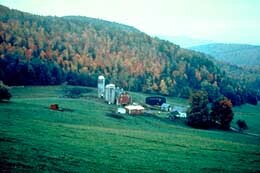 Barnet, Vermont. Photo: Robert McCullough. From the days when Thomas Jefferson envisioned the new republic as a nation dependent on citizen farmers for its stability and its freedom, the family farm has been a vital image in the American consciousness. As the main structures of farms, barns evoke a sense of tradition and security, of closeness to the land and community with the people who built them. Even today the rural barn raising presents a forceful image of community spirit. Just as many farmers built their barns before they built their houses, so too many farm families look to their old barns as links with their past. 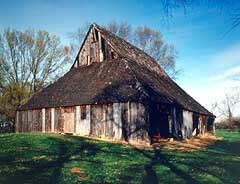 Old barns, furthermore, are often community landmarks and make the past present. Such buildings embody ethnic traditions and local customs; they reflect changing farming practices and advances in building technology. In the imagination they represent a whole way of life. Yet historic barns can be refitted for continued use in agriculture, often at great savings over the cost of new buildings. This Brief encourages the preservation of historic barns and other agricultural structures by encouraging their maintenance and use as agricultural buildings, and by advancing their sensitive rehabilitation for new uses when their historic use is no longer feasible. 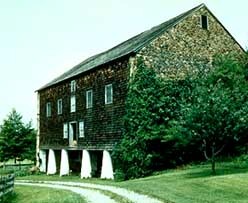 The first great barns built in this country were those of the Dutch settlers of the Hudson, Mohawk, and Schoharie valleys in New York State and scattered sections of New Jersey. (2) On the exterior, the most notable feature of the Dutch barn is the broad gable roof, which in early examples (now extremely rare), extended very low to the ground. A gable roof, center wagon doors with pent roof, stock door at the corners, and horizontal clapboarding are all typical features of the Dutch barn. Photo: S. Matson. On the narrow end the Dutch barn features center doors for wagons and a door to the stock aisles on one or both of the side ends. A pent roof (or pentice) over the center doors gave some slight protection from the elements. The siding is typically horizontal, the detailing simple. Few openings other than doors and traditional holes for martins puncture the external walls. (3) The appearance is of massiveness and simplicity, with the result that Dutch barns seem larger than they actually are. To many observers the heavy interior structural system is the most distinctive aspect of the Dutch barn. Mortised, tenoned and pegged beams are arranged in "H"-shaped" units that recall church interiors, with columned aisles alongside a central space (here used for threshing). This interior arrangement, more than any other characteristic, links the Dutch barn with its Old World forebears. 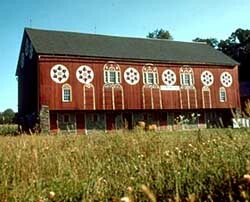 The ends of cross beams projecting through the columns are often rounded to form "tongues," a distinctive feature found only in the Dutch barn. Relatively few Dutch barns survive. Most of these date from the late 18th century. Fewer yet survive in good condition, and almost none unaltered. Yet the remaining examples of this barn type still impress with the functional simplicity of their design and the evident pride the builders took in their work. 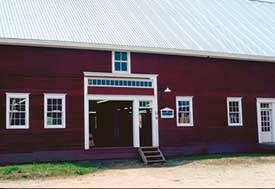 The bank barn gets its name from a simple but clever construction technique: the barn is built into the side of a hill, thus permitting two levels to be entered from the ground. The lower level housed animals, the upper levels served as threshing floor and storage. The hillside entrance gave easy access to wagons bearing wheat or hay. (Fodder could also be dropped through openings in the floor to the stabling floor below.) The general form of the bank barn remained the same whether it was built into a hillside or not. Where a hill was lacking, a "bank" was often created by building up an earthen ramp to the second level. A gently sloping roadbed shows the "bank," from which bank barns get their name. Photo: NPS files. 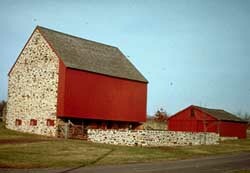 Bank barns were ordinarily constructed with their long side, or axis, parallel to the hill, and on the south side of it. This placement gave animals a sunny spot in which to gather during the winter. To take further advantage of the protection its location afforded, the second floor was extended, or cantilevered, over the first. The overhang sheltered animals from inclement weather. The extended forebay thus created is one of the most characteristic features of these barns. In some bank barns, the projecting beams were not large enough to bear the entire weight of the barn above. In these cases, columns or posts were added beneath the overhang for structural support. Crib barns form another barn type significant in American agriculture. Found throughout the South and Southeast, crib barns are especially numerous in the Appalachian and Ozark Mountain States of North Carolina, Virginia, Kentucky, Tennessee and Arkansas. Composed simply of one, two, four or sometimes six cribs that served as storage for fodder or pens for cattle or pigs, crib barns may or may not have a hayloft above. Crib barns were typically built of unchinked logs, although they were sometimes covered with vertical wood siding. 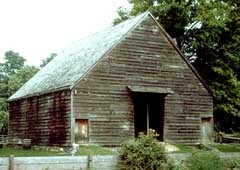 Unaltered examples of early crib barns normally have roofs of undressed wood shingles. In time, shingle roofs were usually replaced with tin or asphalt. The rustic appearance of crib barns is one of their most striking features. The cribs sometimes face a covered gallery or aisle running across the front. In another arrangement, the cribs are separated by a central driveway running through the building. This latter arrangement defines the double crib barn. In double crib barns the second story hayloft is sometimes cantilevered over the ground floor, resulting in a barn of striking appearance. Circular barns are found throughout the country. This round barn, dated 1910, is in Vermont. It is 80 feet in diameter. Photo: Jay White. Round barns were promoted for a number of reasons. The circular form has a greater volume-to-surface ratio than the rectangular or square form. For any given size, therefore, a circular building will use fewer materials than other shapes, thus saving on material costs. Such barns also offer greater structural stability than rectangular barns. And because they can be built with self-supporting roofs, their interiors can remain free of structural supporting elements, thereby providing vast storage capabilities. The circular interior layout was also seen as more efficient, since the farmer could work in a continuous direction. In general, multi-sided barns—frequently of 12 or 16 sides—are earlier than "true round" barns. Earlier examples also tend to be wood sided, while later ones tend to be brick or glazed tile. Interior layouts also underwent an evolution. Early round barns placed cattle stanchions on the first floor, with the full volume of the floor above used for hay storage. 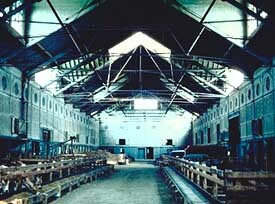 In later barns, the central space rose from the ground floor through the entire building. Cattle stanchions arranged around a circular manger occupied the lower level; the circular wagon drive on the level above permitted hay to be unloaded into the central mow as the wagon drove around the perimeter. In the last stage of round barn development, a center silo was added when silos became regular features on the farm (in the last decades of the nineteenth century). In some cases, the silo projected through the roof. The claims for the efficiency of the round barn were overstated, and it never became the standard barn, as its proponents had hoped. Nevertheless, a great number were built, and many remain today the most distinctive farm structures in the communities in which they stand. Affinities of this barn type with the Dutch barn are striking: the long, low roof lines, the door in the gable end, and the internal arrangement of stalls in aisles on either side of the central space are all in the tradition of the Dutch barn. This 19th century tobacco barn, characterized by its steep gable-on-hip roof, is located in Prince Georges County, Maryland. Photo: Jack E. Boucher, NPS. The barn types discussed here are only some of the barns that have figured in the history of American agriculture. As with Dutch barns, some reflect the traditions of the people who built them: Finnish log barns in Idaho, Czech and German-Russian house barns in South Dakota, and "threebay" English barns in the northeast. Some, like the New England connected barn, stem from regional or local building traditions. Others reflect the availability of local building materials: lava rock (basalt) in south-central Idaho, logs in the southeast, adobe in California and the southwest. Others are best characterized by the specialized uses to which they were put: dairy barns in the upper midwest, tobacco barns in the east and southeast, hop-drying barns in the northwest, and rice barns in South Carolina. Other historic barns were built to patterns developed and popularized by land-grant universities, or sold by Sears, Roebuck and Company and other mail-order firms. And others fit no category at all: these barns attest to the owner's tastes, wealth, or unorthodox ideas about agriculture. All of these barns are also part of the heritage of historic barns found throughout the country. Historic barns are preserved for a number of reasons. Some are so well built that they remain useful even after a hundred years or more. Many others are intimately connected with the families who built them and the surrounding communities. Others reflect developments in agricultural science or regional building types. 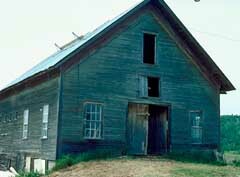 Before restoring a historic barn or rehabilitating it for a new use, an owner should study the building thoroughly. This process involves finding out when the barn was built, who built it, and why. It means understanding how the building was changed through the years. It means assessing the condition of the barn, and understanding its components. This process has as its end an appreciation of the building's historic character, that is, the sense of time and place associated with it. It is this physical presence of the past that gives historic buildings their significance. To assess the historic character of a barn, an owner should study old photographs, family records, deeds, insurance papers, and other documents that might reveal the building's appearance and history. Neighbors and former owners are often important sources of information. Local libraries, historical societies and preservation organizations are additional sources of help. As part of this overall evaluation, the following elements should be assessed for their contributions to the property. They are the principal tangible aspects of a barn's historic character, and should be respected in any work done on it. A barn is integral with its setting—orchards, ponds, fencing, streams, country roads, windmills, and silos. Photo: Jack E. Boucher, HABS Collection, NPS. Setting is one of the primary factors contributing to the historic character of a barn. Farmers built barns in order to help them work the land; barns belong on farms, where they can be seen in relation to the surrounding fields and other structures in the farm complex. A barn crowded by suburbs is not a barn in the same sense as is a barn clustered with other farm buildings, or standing alone against a backdrop of cornfields. Hence, the preservation of barns should not be divorced from the preservation of the setting: farms and farmland, ranches and range, orchards, ponds, fields, streams and country roads. Other important elements of setting include fences, stone walls, roads, paths, barnyards, corrals, and ancillary structures such as windmills and silos. (Silos, indeed, have become so closely associated with barns as nearly to have lost their "separate" identities.) These features help place the building in the larger agricultural context, relating it to its purpose in the overall rural setting. 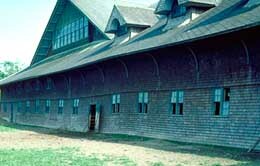 The shape of barns, as with other buildings, is of great importance in conveying their character. (For round barns, the shape is the defining feature of the type.) Often the form of a barn is visible from a distance. Often, too, more than one side can be seen at the same time, and from several different approaches. As a general rule, the rear and sides of a barn are not as differentiated from the front, or as subordinated to it, as in other buildings. This enormous late 19th century barn in Shelburne, Vermont, displays a complexity and sophistication of roofing elements. See interior, below. Photo: NPS files. The roof is among the most important elements of building form. Barns are no exception. The gable roof on Dutch and Prairie barns, the cone-shaped, dome-shaped, eight or twelve-sided roof of round barns, and the gambrel roof of the "typical" barn are among the most prominent features on these buildings. A barn roof can often be seen from a distance, and for this reason must be considered a major feature. Among the major impressions given by well-maintained historic barns are those of strength, solidity and permanence. These impressions largely result from the durability and ruggedness of the materials used in them. Weathered wood siding, irregularly shaped stones, or roughhewn logs on the exterior; dressed beams, posts scarred by years of use, and plank flooring on the interior all contribute to the special character of barns. Unlike historic residential, industrial and commercial buildings, barns generally have few openings for windows and doors. Yet the openings found in barns are important both to their functioning and to their appearance. Typically, large wagon doorways and openings to the hayloft are among the most striking features on barns. Not as prominent as these large openings, but important from a functional perspective, are the ventilator slits found on many barns. With important exceptions (dairy barns, for example), windows are few, and are normally small. The relative absence of openings for windows and doors adds to the overall impression of massiveness and solidity conveyed by many historic barns, and is one of the reasons why they often appear to be larger than they are. The interior of the barn in Shelburne, Vermont, is a magnificent space that included an overhead hay loft with tracks that allowed workers to drop hay to the floor below. Photo: NPS files. The impression received upon stepping into many historic barns is that of space. Not infrequently, the entire building appears as a single large space. To enter these buildings is sometimes to experience the entire expanse of the building at once. Even when haylofts and animal stalls "consume" part of the building, they often do not keep the full expanse of the interior from being seen. In large barns, this can be an imposing sight. More commonly, the barn is a combination of confined spaces on the lower floor and a large open space above; in this case, the contrast between the confined and open spaces is also striking. The openness of the interior, furthermore, often contrasts with the "blankness" typical of many barn exteriors, with their relatively few openings. The exposed structural framework is a major component of the character of most historic barns. Typically, barns were built for strictly utilitarian purposes. Accordingly, barn builders made no effort to conceal the structural system. Yet for that very reason, barns achieve an authenticity that accounts for much of their appeal. In some barns, the load-bearing members are of enormous dimensions, and the complex system of beams, braces, posts, rafters and other elements of the revealed framework create an imposing sight. Yet even in small barns, the structural system can be an important feature, helping to determine the historic character of the building. Hex signs are among the wide range of decorative elements found on American barns. Photo: NPS files. Historic barns, like modern ones, are structures built for use. Nevertheless, decorative elements are not lacking on barns. Foremost among these is color (red being most common). Dutch barns traditionally sported distinctively shaped martin holes in the upper reaches of the building. Traditional hex signs on Pennsylvania barns are so well known as to have entered the mainstream of popular culture and taken on a life of their own. Decorative paint schemes, including contrasting colors to "pick out" cross members of the external framework, are common (these most frequently take the form of diamonds or "X's" on the main doors). Sign painters often took advantage of the size and visibility of barns in an age before billboards. "Mail Pouch Tobacco" signs were nearly as numerous in the first quarter of the 20th century as patent medicine ads were in the last quarter of the 19th. Another decorative motif on historic barns is the arrangement of spacings between bricks to form decorative patterns (as well as to ventilate the barn). In addition to these elements, arched window hoods, patterned slate roofs, fanciful cupolas, weathervanes, lightning rods and ornamented metal ventilator hoods can be found on historic barns. Finally, individual farmers and barn builders sometimes added personal touches, as when they carved or painted their names on anchor beams, or painted their names and the date over the entrance. The elements discussed here are major components of historic barns. Yet no list can convey the full historic character of an individual building. It is very important, therefore, to study each structure carefully before undertaking any project to restore it or to adapt it to new uses. This well-maintained late 18th century barn is located in Worcester, Pennsylvania. Note the use of indigenous stone in the structure and surrounding fencing. Photo: Robert McCullough. If a building is to be kept in good repair, periodic maintenance is essential. Barns should be routinely inspected for signs of damage and decay, and problems corrected as soon as possible. Water is the single greatest cause of building materials deterioration. The repair of roof leaks is therefore of foremost importance. Broken or missing panes of glass in windows or cupolas are also sources of moisture penetration, and should be replaced, as should broken ventilation louvers. Gutters and downspouts should be cleaned once or twice a year. Proper drainage and grading should be ensured, particularly in low spots around the foundation where water can collect. Moisture is one major threat to historic buildings. Insects, especially termites, carpenter ants and powder post beetles, are another. Regular examinations for infestations are essential. Additional periodic maintenance measures include repair or replacement of loose or missing clapboards, and inspections of foundations for cracks and settlements. Vegetation growing on the barn should be removed, and shrubs or trees near it should be cleared if they obstruct access, or, more serious, if roots and other growths threaten the foundation. Soil and manure buildups against the foundation should be removed. Such buildups hold water and snow against wooden elements, and promote rot. They also promote insect infestations. Door hardware should be checked for proper fitting and lubricated yearly. Lightning rods should be kept in proper working order, or added, if missing. Many historic barns require more serious repairs than those normally classed as "routine maintenance". Damaged or deteriorated features should be repaired rather than replaced wherever possible. If replacement is necessary, the new material should match the historic material in design, color, texture, and other visual qualities and, where possible, material. The design of replacements for missing features (for example, cupolas and dormers) should be based on historic, physical, or pictorial evidence. This horse barn, ca. 1875, is in Stowe, Vermont. Its cupola has been removed for repair. Photo: NPS files. 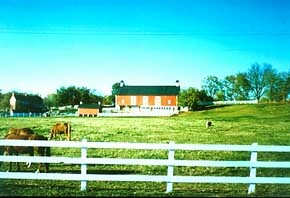 Many barn owners have substantial experience in the care of farm structures. Where expertise is lacking, it will be necessary to consult structural engineers, masons, carpenters, and architects, as appropriate. In addition, for many repairs, a knowledge of historic building techniques may be necessary. Ensuring the structural soundness of a historic barn is vital both to its continued usefulness and to the safety of its occupants. The following signs of structural settlements may require the services of a structural engineer to evaluate: major cracks in masonry walls, visible bowing, leaning and misalignment of walls, sagging windows and doors, separation of cladding from structural frames, trusses pulling away from seating points at support walls, sagging joists and rafters, and noticeable dips in the roof between rafters. 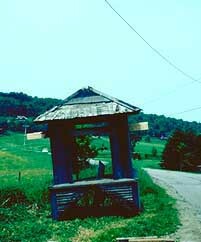 This cupola will be repaired and returned to the horse barn roof (see photo, above). Photo: NPS files. To correct these problems, masonry foundations may have to be reset or partially rebuilt. Sills and plates may need to be repaired or replaced. Walls may have to be straightened and tied into the structural system more securely. Individual structural members may need bracing or splicing. Moisture can damage historic materials severely, and, in extreme cases, jeopardize the structural integrity of a building. Every effort must be made to secure a weathertight roof. This may require merely patching a few missing shingles on a roof that is otherwise sound. In more severe cases, it may require repairing or replacing failing rafters and damaged sheathing. Such extreme intervention, however, is not usual. More typical is the need to furnish "a new roof," that is, to replace the wooden shingles, asphalt shingles, slate shingles or metal covering the roof. Replacing one type of roofing with another can produce a drastic change in the appearance of historic buildings. Great care should be taken, therefore, to assess the contribution of the roof to the appearance and character of the barn before replacing one type of roofing material with another. While some substitute materials (such as synthetic slate shingles) can be considered, the highest priority should be to replace in-kind, and to match the visual qualities of the historic roof. Gutters and downspouts should be replaced if damaged or missing. Finally, dormers, cupolas, metal ventilators and other rooftop "ornaments" provide needed ventilation, and should be repaired if necessary. In addition to the roof and the foundation, other exterior elements may need repair, including siding, brick and stonework, dormers and cupolas, windows and doors. Shutters may be falling off, doors may need to be rehung, and missing louvers replaced. The exterior may need repainting. (Unpainted brick or stone barns, however, should never be painted.) In the case of masonry barns, repointing may be necessary. If so, mortar that is compatible in appearance and composition with the historic mortar must be used. Using mortar high in portland cement can damage historic brick or stone. Masonry cleaning should be undertaken only when necessary to halt deterioration or to remove heavy dirt, and using the gentlest means possible. Sandblasting and other physical or chemical treatments that damage historic materials should not be used. Likewise, power washing under high pressure can also damage building material. Typical interior repairs may include removing and replacing rotten floorboards, and repair or replacement of partitions, storage bins, gutters and stalls. Concrete floors may be cracked and in need of repair. Wiring and plumbing may need major overhaul. This historic barn was successfully converted into a furniture factory. Photo: NPS files. Some barns have served the same uses for generations, and need only periodic repairs and routine maintenance. Others have become obsolete and need extensive updating for modern farming methods. (To house livestock, for example, a barn may need new feeding, watering, waste removal, electrical, plumbing and ventilation systems.) Similarly, barns that can no longer be used for agriculture at all normally require changes to adapt them for commercial, office, or residential use. In such cases barns need more extensive work than the maintenance and repair treatments outlined above. However, when rehabilitating a historic barn for a new farming operation or a new use entirely, care must be taken to preserve its historic character while making needed changes. A successful rehabilitation project is best guaranteed when a work plan is drawn up by someone familiar with the evaluation of historic structures, and when it is carried out by contractors and workmen experienced with the building type and committed to the goal of retaining the historic character of the property. Help in formulating rehabilitation plans and in locating experienced professionals is normally available from the State Historic Preservation Office and local preservation groups. Repair rather than replace historic windows whenever possible, and avoid "blocking them down" or covering them up. Avoid the insertion of numerous new window openings. They can give a building a domestic appearance, radically altering a barn's character. However, if additional light is needed, add new windows carefully, respecting the size and scale of existing window openings. The conversion of barns to housing is not new, but has become increasingly popular in recent years. Yet the changes involved in converting most barns to housing are so great that such conversions rarely preserve the historic character of the resource. Ordinarily, numerous windows are inserted, walls are heavily insulated and refinished, the interior volume is greatly reduced, chimneys and other fixtures normally lacking in barns are added, and site changes, such as close-in parking and residential landscaping are made, giving the building a greatly altered site. Many other barns are "converted" to houses by dismantling them, discarding the exterior, and reusing the internal structural system in a new building. The beams are saved, but the barn is lost. In cases where the conversion from barns to houses has been successful, the positive outcome results in large measure from the careful choice of the barn: A modest-sized barn with a sufficient number of existing residential-scale windows, in which nearly the whole internal volume can be used as is, without building numerous new partitions or extending a new floor across the open space (haylofts in such cases serving as loft-space for "second story" bedrooms). Historic barns form a vital part of our Nation's heritage. Not every historic barn can be saved from encroaching development, or easily brought back into productive use. Yet thousands of such structures can be repaired or rehabilitated for continued agricultural use or for new functions without destroying the very qualities that make them worth saving. By carefully examining the historic significance of each structure, owners of historic barns can draw up plans that preserve and reuse these historic structures while maintaining their historic character. Nore V. Winter, "Design on the Farm: A Rural Preservation Forum," Unpublished proceedings from a Conference sponsored by the National Trust for Historic Preservation, Denver, Colorado, January 13-14, 1986. Descriptions of the primary barn types featured in this section are heavily indebted to Eric Arthur and Dudley Witney, The Barn: A Vanishing Landmark in North America. Greenwich, CT: New York Graphic Society, Ltd., 1972. John Fitchen, The New World Dutch Barn: A Study of Its Characteristics, Its Structural System, and Its Probable Erectional Procedures. Syracuse, NY: Syracuse University Press, 1968, p 136. Washington's "round" barn, actually a 16-sided barn, is shown in Lowell J. Soike, Without Right Angles: The Round Barns of Iowa. Des Moines: Iowa State Historical Department, 1983. 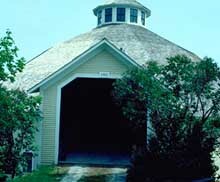 Round, octagonal and other polygonal barns are normally all classed as "round barns." When it is necessary to be more precise, the term "true round" is used to distinguish round barns from hexagonal, octagonal, or other polygonal barns. The Shaker Round Barn is a true round barn. Gutted by fire in 1864, the barn was rebuilt shortly thereafter. See Polly Matherly and John D. McDermott, Hancock Shaker Village National Historic Landmark study, History Division, National Park Service, Washington, D.C. In addition to the sources mentioned above, the following studies were important sources for this section: Mark L. Peckham, "Central Plan Dairy Barns of New York Thematic Resources," Albany: New York State Division for Historic Preservation, 1984; and James E. Jacobsen and Cheryl Peterson, "Iowa Round Barns: The Sixty Year Experiment Thematic Resources," Des Moines: Iowa State Historical Department, 1986. These thematic studies document barns listed in the National Register of Historic Places. Charles Klamkin, Barns: Their History, Preservation, and Restoration. New York: Hawthorn, 1973, p 57. The author gratefully acknowledges the invaluable assistance of Mary Humstone, National Trust for Historic Preservation, Mountains/Plains Regional Office, and Sharon C. Park, Kay D. Weeks, and Robert Powers of the National Park Service. Significant contributions were also made by Stan Graves, Texas Historical Commission, on behalf of the National Conference of State Historic Preservation Officers; Shirley Dunn, Dutch Barn Preservation Society, Rensselaer, NY; Janis King, Knoxville, IL; Marilyn Fedelchak, National Trust for Historic Preservation; Fred Swader, U.S. Department of Agriculture, and Linda McClelland, National Register of Historic Places. In addition, useful comments and technical assistance were provided by the staff of the Technical Preservation Services Branch, directed by H. Ward Jandl, by the cultural resources staff of National Park Service Regional Offices, by Jack Boucher, Catherine Lavoie and Ellen Minnich of the Historic American Buildings Survey, and by Alicia Weber of the Park Historic Architecture Division. Arthur, Eric and Dudley Witney. The Barn: A Vanishing Landmark in North America. Greenwich, CT: New York Graphic Society Ltd., 1972. Fitchen, John. The New World Dutch Barn: A Study of Its Characteristics, Its Structural System, and Its Probable Erectional Procedures. Syracuse, NY: Syracuse University Press, 1968. Halsted, Byron D., ed. Barns, Sheds and Outbuildings. New York: O. Judd Co., 1881. Rpt. : Brattleboro, VT: Stephen Greene Press, 1977. Humstone, Mary. Barn Again! A Guide to Rehabilitation of Older Farm Buildings. Des Moines, IA: Meredith Corporation and the National Trust for Historic Preservation, 1988. Klamkin, Charles. Barns: Their History, Preservation and Restoration. New York: Hawthorn, 1973. Schuler, Stanley. American Barns: In a Class by Themselves. Exton, PA: Schiffer Publishing Ltd., 1984. Schultz, LeRoy G., comp. Barns, Stables and Outbuildings: A World Bibliography in English, 1700-1983. Jefferson, NC, and London: McFarland and Co., 1986. Stokes, Samuel N., et al. Saving America's Countryside: A Guide to Rural Conservation. Baltimore and London: Johns Hopkins University Press, 1989.